Forest fact: I should probably be ashamed to admit the following, but I’m kind of fascinated by living statue buskers. I always wonder what they do at the end of a shift. Do they take the metro home in full get-up? Do they sit still as a statue on the ride? It seems that I secretly like to watch these spectacles that everyone mocks. I get a kick out of mimes. I own contact juggling balls that I will learn to use some day and wow you with my skills. So, it might not surprise you to hear that I’m also a little fascinated by flair. But that’s between me and YouTube….in the privacy of my own home. However, when it comes to cocktails, I don’t need or want living statues, mimes, flair or even contact juggling balls involved, so let’s chat a bit about the recently opened flair-o-rific Bacardi/Laurent Greco project: the Bacardi Mojito Lab. Allen and I popped in and found that Wednesdays are “afterworks.” From 19h00 to 21h00 it’s 25 Euros to get in the door, which gets you two drinks and buffet table grazing. 50 Euros lighter, in we go. Hello, circa 1980’s all-inclusive spring break destination dance club! Dim lighting, acid green touches, pumping dance music…you get the picture. The buffet tables were classed up (I use that lightly) with single red roses in tall vases and scattered petals. Flair videos loop on screens from wall to wall. While, I’ve been told flair bartending is still quite big in France, this is the first place I’ve actually seen it. The food was nice little bite-sized nibblies for a buffet, but the set up was annoying. No plates, no napkins – so you either sat directly at the buffet table to pop bites in your mouth while others reached around you to grab said bites, or you reached around the people sitting at the buffet tables. For drinks, you go downstairs. I’m not sure what kind of a crowd they expect to draw. They’re at Bastille with so many competing (and probably cheaper) bars nearby. You can’t spit without hitting a bar in Paris that serve mojitos, so I’m curious as to what they think the attraction will be. I’ve been told this is a popup – so perhaps they’re banking on their ephemeral status for interest. 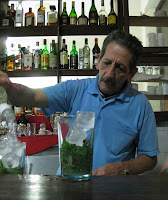 They also offer classes if you want to learn to flair up a mojito at home. 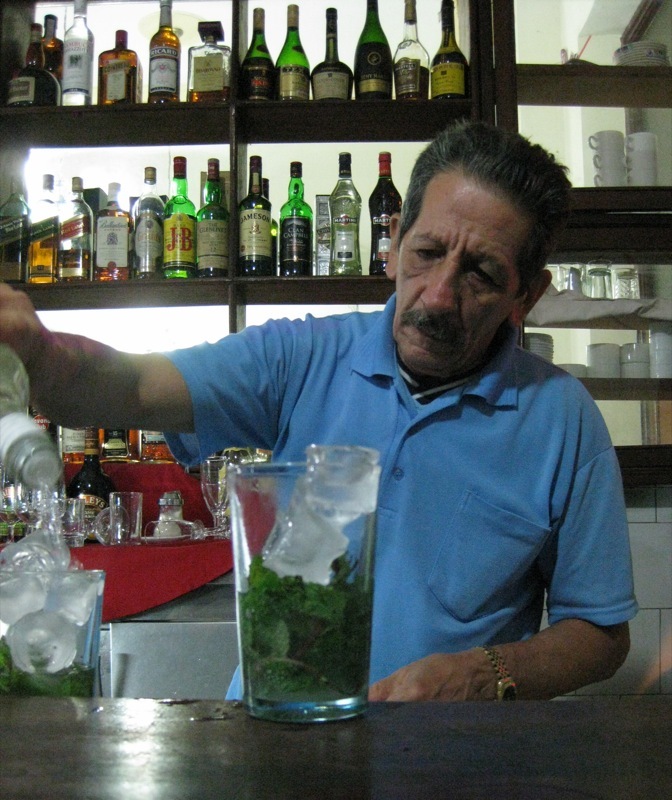 As for me, the only time I want a mojito is if it’s being made by old and stoic Felix at dodgy local Bar Castillo de Farnes in Havana where Che and Fidel toasted the revolution (true story – there he is in he picutre). And, he definitely doesn’t do flair. Otherwise, Paris, you can keep your mojito trend and I’ll stick with the martini search. Whaaa? Paris, 2010?? Mojitos and neon and all-you-can-eat canapés? How bizarre – I sort of love it! More pop-up marketing hoo-ha from a conglomerate, I say. This address served the community and Paris' nightlife scene much better in its second-to-last incarnation as a glory hole bar. No joke. Amy: and I kind of love that you sort of love it! 🙂 seriously, I could almost get on board w/ itwhen you put it like that. But I just don't want to get onboard if I have to pay 25 Euros for it and be told I'm getting something upscale & special. Omid: you must know that comment begs the question – how do you know that!? I thought those things only existed in movies? I see a opportunity for some enterprising Paris bloggers: "The Dark Side of the City of Light: the search for the best glory holes in Paris…"
What do you mean by flair orific? Also I wish you had talked about the atmosphere, the quality of the drinks..it seems to me that something is missing in your story! By 'flair-o-riffic' i just meant they seem to be more focused on the details and showing off with throwing bottles around than on the drinks. and, yes – even at the time of posting this I knew I was a bit light on the drink description. But, i just wasn't enthusiastic about them enough one way or the other. they were both well enough made. But, for me, i've seen so damn many mojitos in Paris that I just didn't get excited. And by well-enough, I mean the proportions were fine, lots of ice, mint was fresh, Perrier wasn't flat. I guess one thing I do like about the cocktails is that they are trying to use the best variety of mint for each drink. I guess i'm just tired of seeing mojito menus & naturally a little hesitant about food/drink that seems too gimmicky. They also offer the mojito trio which is three variations served up on cocktail glasses for 14 Euros – so you can get a taste of a few without buying 3 drinks. hello! i was there last night (not during the afterworks) and it was a really nice experience. bartender Jerôme on the street level was amazingly friendly and chatty and once he discovered i was into cocktail making myself he showed me all the different kind of mints he uses (including chocolate mint) and a few other rare ingredients. the classic mojitos are good enough for me but it was fun to try some of the more "molecular" cocktails, after all why should cocktail just be about taste and not experimentation? the special ones with liquid nitrogen are done downstairs and the boys there don't have much time to chat but are extremely friendly. i liked that we had a choice between the more quiet upstairs and the "noisy" downstairs for young people. the crowd yesterday was mixed, anything from young to middle age (few though) and Jerôme was equally nice to all age groups, which is a very rare quality in these kind of places. so all in all, i really recommend this place for anyone who likes rhum based cocktails as this a friendly and fun experience. the plus side is that almost next door i recommend "Volver", a small, friendly and delicious argentinian restaurant. knowing your blog, i think you would have better enjoyed the Mojito lab, had you come on any other time that this afterworks do. and by the way, all the best for the New Year, and thanks for your blog, if it wasn't for you my range of cocktail places in Paris would be a lot smaller. hi Columbine! Thanks very much for the update and further detail on this (I really appreciate getting reader feedback to round out my reviews). Happy New Year back to you and thanks for reading as well since I wouldn't be blogging much if it weren't for nice readers who pay attention! Look forward to sharing more (and getting more) cocktail info with you in 2011.